Joseph Mallozzi's Weblog: Let’s call it November 29th: Hong Kong Day #4! Massage massacre! Happy Valley Racetrack! Let’s call it November 29th: Hong Kong Day #4! Massage massacre! Happy Valley Racetrack! 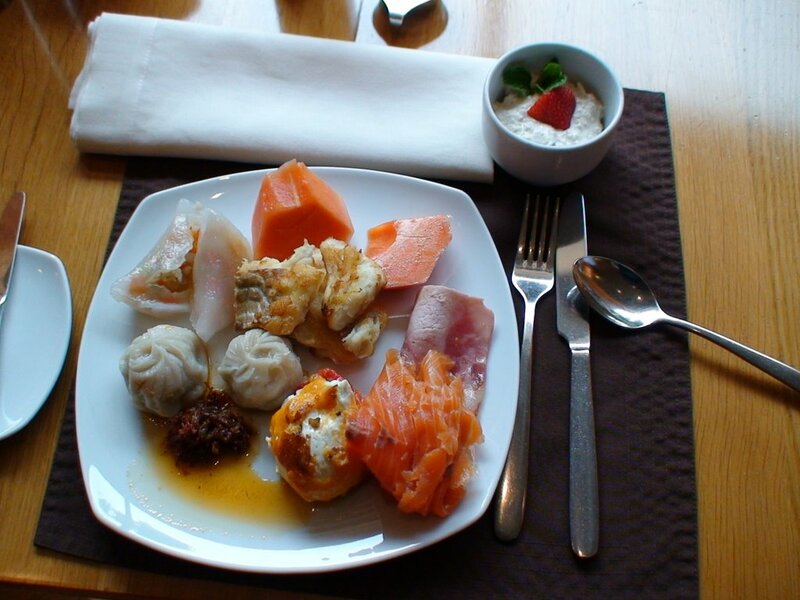 I managed to wake up a little earlier today and squeeze in a work-out before heading down for a power breakfast: grilled fish (for low-fat protein), smoked salmon (for omega 3 oils), oatmeal and muesli (for fibre), papaya (for vitamin c), Eggs Benny on a baked tomato (for lutein and lycopene), and dim sum and ham (for flavoring). Incidentally, one of the things I’m about to take away from this trip is the secret to great oatmeal: cream and plenty of sugar. A little reading, a little organizing, and then it was downstairs for our respective massages. I had my wife book me the Swedish massage, assuming I could count on a nice, relaxing, light-touch session. I imagined I’d be so relaxed, I might even fall asleep. How embarrassing would that be? As it turned out, I had nothing to fear. I was awake for the full 90 minutes of poking, prodding, gouging, twisting, and pulling. “You’re tense,”noted my 4’10” masseuse with the fingers of stone. I pointed out that the tenseness she was feeling may have been a result of my body’s reaction to the deep-tissue treatment. She informed me that while she could opt for a lighter touch, she would, in essence, be cheating me and my muscles of the workout I had paid for. Then, she zeroed in on my legs, demonstrating an exquisitely excruciating calf grip that I’ll no doubt use on Carl Binder the next time he gets out of line in the writer’s room. Then, onto my back, digging her fingers into my presumably tight shoulders and informing me I had “too much fire” in my body and needed more rest. She moved onto my arms, swinging them up around and back, their limited range of motion eliciting laughter from her. “Not so flexible,”she marveled, pulling and twisting. She finished with my head, kneading the base of my skull, the area around my face, executing a “lymphatic drainage”, and then punctuating the session with a triple bare knuckle rap atop my forehead. “There, how do you feel?”she asked.“ Sore?” “Only where you punched me in the face,”I told her, not exactly kidding. She chuckled and informed me that I might be sore tonight and tomorrow morning. “But don’t worry,”she said.“The worst you’ll experience is pain. ”The worst? I’m not exactly sure what she meant by that, if it was supposed to be reassuring, but I suppose I can draw solace from the fact that it’s unlikely I will die as a result of the beating I took. We showered up, then headed down to one of the hotel restaurants for dim sum. The dim sum list turned out to be less than inspired, so we opted to go a la carte: a very good deep-fried squab (in Hong Kong, they dispense with the niceties and just call it pigeon), a nicely-marbled oxtail brisket, and a delicious, perfectly-cooked steamed pink groupa (sic) with soy and green onions. 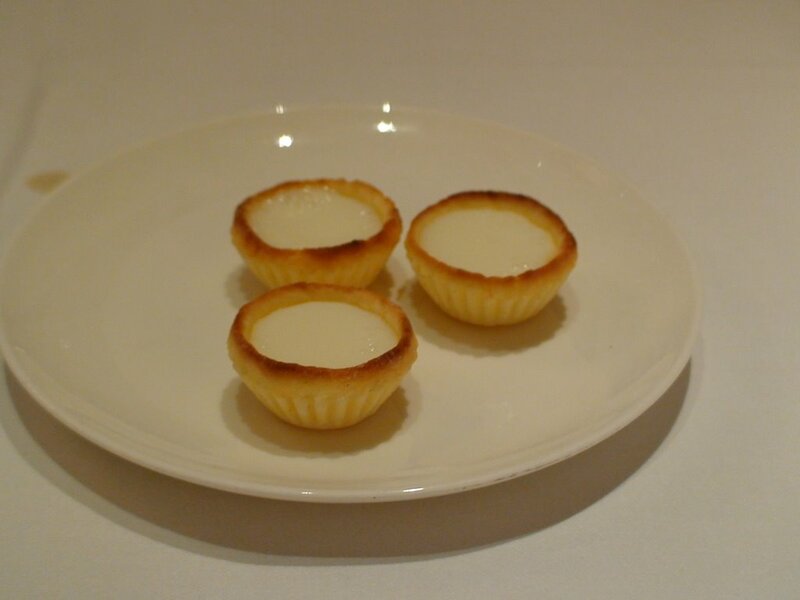 Sadly, there were no egg tarts on the menu, but the waiter did suggest the house milk tarts, three tiny but tasty treats. 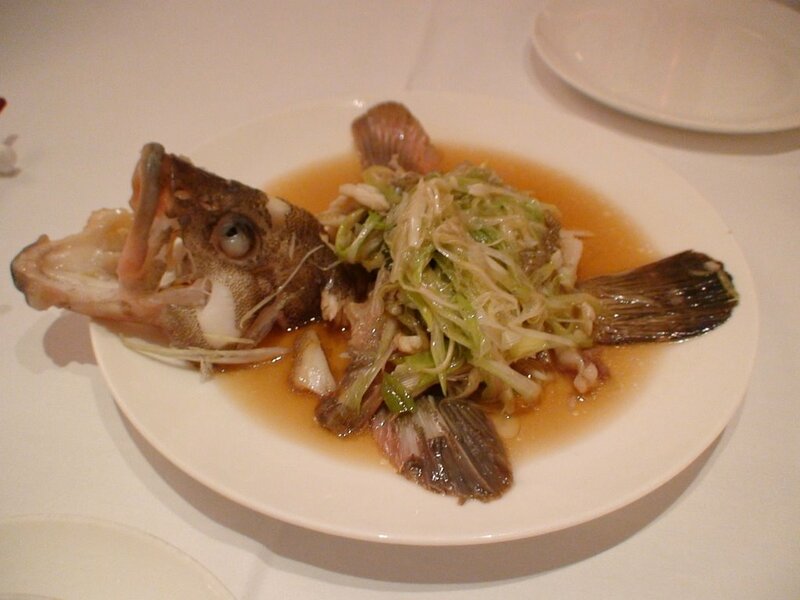 I wasn’t able to take a picture of the groupa before the waiter got to it, but I did get a snap of the little fella after it had been deboned. After lunch, we hopped into a taxi and had the driver drop us off at Mitsukoshi, the Hong Kong branch of my favorite Japanese department store. Sadly, it closed down three months ago, so we had to settle for Sogo. Not quite the same thing, am I right? 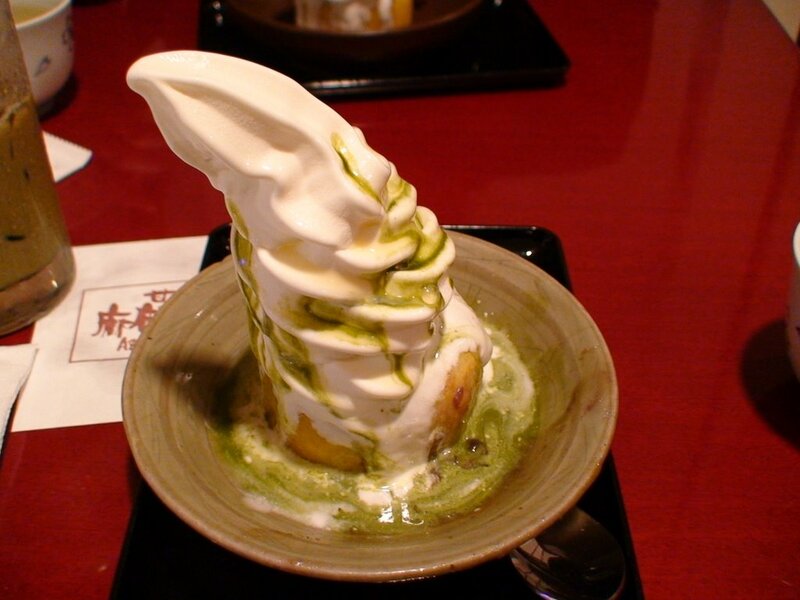 We wandered, browsed, and eventually stopped off for a little snack at a casual Japanese eatery called Azubasabo where I enjoyed (no really) a pumpkin-chicken soup, and a vanilla soft ice cream sundae on sweet potato cake with green tea sauce. Taaaaasty! Eventually, we made our way to the Excelsior Hotel where we boarded a bus for the Happy Valley Race Track (and I enjoyed a special Macau-style egg tart, sweeter and carmelized). Once there, we were ushered up to the visitor’s box where we enjoyed a surprisingly good buffet. 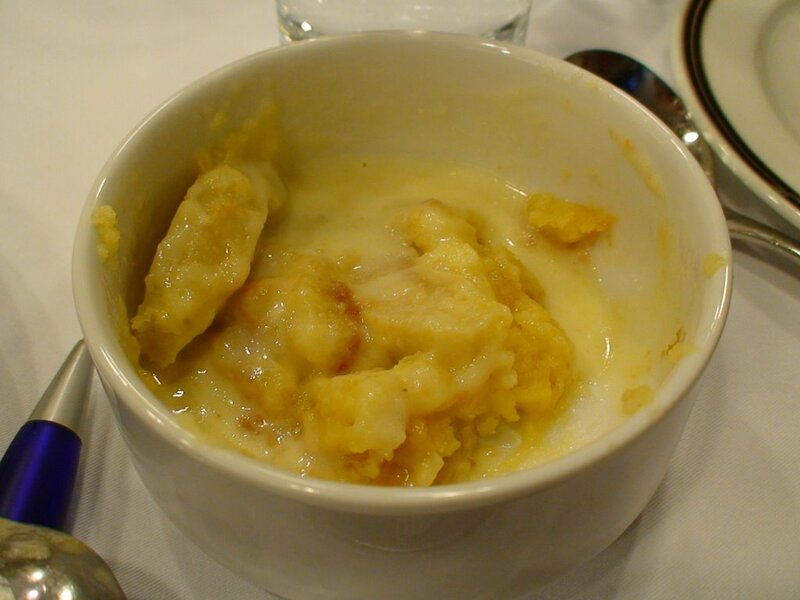 The highlights included braised ox-tail, smoked salmon, and various desserts including the dish pictured above – which was some sort of pound cake I christened with three shots of crème anglaise (the last picture). After dinner, I immediately set to work on my picks for the various races, quickly working out a system in which horses were allotted points for various things such as strong jockeys, trainers, recent histories on similar tracks, overall winning percentage, performance in their last five races, positioning. It was a complicated process and very time consuming, but ultimately very rewarding in that it kept me too busy to make conversation with the other people in our tour group. My selections, on the other hand, were abysmal. Apparently, you CAN lose them all. Late night. We just got back in and I can already feel my back stiffening up. What I need is a good massage. Previous Article November 27th – Let’s call it the 28th: Hong Kong Day #3! Lantau Island! A trip to the tailor! I just couldn’t let this entry sit here all alone, unnoticed. You’ve come a long way, Mr. M!